To participate in a tax sale, bidders should first create an account on Bid4Assets. Registration is free. Once you have made an account, most counties will require that bidders submit a deposit to Bid4Assets. This amount will vary depending on the county. 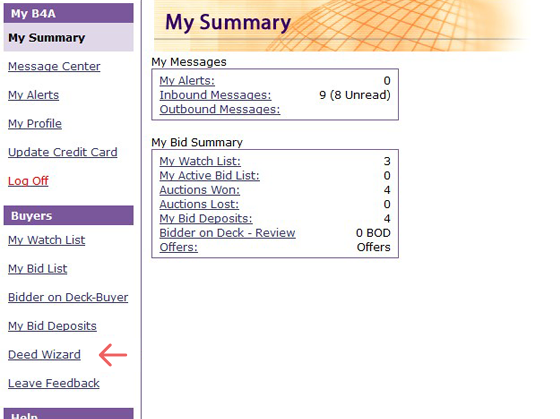 Once your deposit has been submitted and processed by Bid4Assets you will receive an email notification and an alert in your Bid4Assets message center that you have been cleared to bid. Note: One deposit qualifies you to bid on every item in the tax sale. If you wish to bid on multiple items, you still only need to submit a single bid deposit. You can find deposit instructions for a county’s sale by visiting its storefront page or any of the auctions available in the sale. To view a full guide for submitting a deposit to Bid4Assets click here. Yes. If you do not participate or do not win any properties in the tax sale, your deposit will be refunded to you. Refund checks are typically mailed out within 10 business days of a tax sale closing, and an email notification will be sent to you when your refund check has been mailed. Can I transfer my deposit to another county’s tax sale? No. If you wish to participate in another county’s tax sale, you will need to submit a separate bid deposit for that county. How do I pay for a tax sale auction I have won? For most tax sales, you will submit payment to Bid4Assets using the same methods you did for your bid deposit (certified check or wire transfer). Payment is usually due within 3 days after the tax sale ends. Note: Several counties require payment be submitted directly to the Treasurer’s office rather than to Bid4Assets. Please review an auction’s “Settlement Requirements” section carefully before participating. How do I determine what goes on my deed? 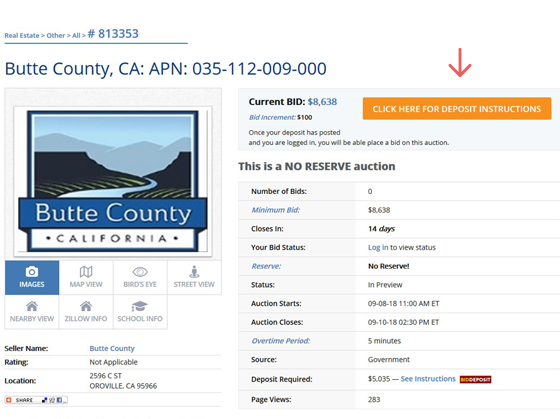 At the end of an auction in which you are the winning bidder, Bid4Assets will send you a notification alerting you via email and your Bid4Assets message center that you have won the auction. Once you have received this notification, you will have the option to utilize Bid4Assets’ Deed Wizard tool, accessible from the main page on your account. Deed Wizard will allow you to specify how you would like any properties you have won in a tax sale to be titled. This tool even allows you to purchase property in the name of a family member or a corporation. Note: Your Deed Wizard information must be filled out within 48 hours of the auction’s closing. If you do not fill it out, your deed information will default to the information on your Bid4Assets account. How long after the auction until I get my deed? Deed transfer can typically take anywhere from three weeks to 90 days depending on the county. What happens if I am the winning bidder and decide not to pay for the property? If the winning bidder does not follow the payment policy, they will forfeit their deposit to the county and may be banned from future tax sales on Bid4Assets.